Background: It is never easy to produce at a high level in your virtual hometown. Dalton Hilliard was not big and he was not fast. He was simply big enough, fast enough and plenty good enough. He proved it at Patterson High and LSU and given the chance to prove it with the Saints, he proved it in a huge way. Hilliard went on to play in all 16 games in five of his eight seasons. Hilliard arrived on the scene in 1986 at the same time as Rueben Mayes. While Mayes established the early edge with a big rookie season, Hilliard eventually became the more productive back. In his third season of 1988, Hilliard rushed for 823 yards and five touchdowns and caught 34 passes for 335 yards and a touchdown. In 1989, Hilliard had a breakout season, setting career highs in every category. He rushed 334 times for 1,262 yards and 13 touchdowns and caught a career high 52 passes for 514 yards and five touchdowns en route to a Pro Bowl berth. He was fifth in the league in rushing and his 13 rushing touchdowns were fourth in the NFL. A knee injury in 1990 really slowed Hilliard and he was never really the same back after the injury. He was part of a division champion team in 1991, rushing for four touchdowns and catching a touchdown pass. In 1992, he rushed for 445 yards and three touchdowns and caught 48 passes for 465 yards and four touchdowns. Hilliard's last season was 1993. He is the third leading rusher with 1,126 yards for 4,164 yards and 39 touchdowns. He added 249 receptions for 2,233 yards and 14 touchdowns. His 53 total touchdowns are third best in team history and he is seventh in scoring with 318 points scored. The Saints became a winner for the first time with Hilliard and he was a big part of that success. Greatest Moment: Hilliard was a model of consistency. He did not put up huge numbers in the sense of the flashy, lights out games. He reserved his top rushing effort for the Saints biggest rival. On Nov. 19, 1989, the Saints faced the Falcons at Fulton County Stadium. Hilliard was superb, rushing 29 times for 158 yards and a touchdown while catching three passes for 22 yards as the Saints won 26-17, rallying from a 17-12 deficit entering the fourth quarter. 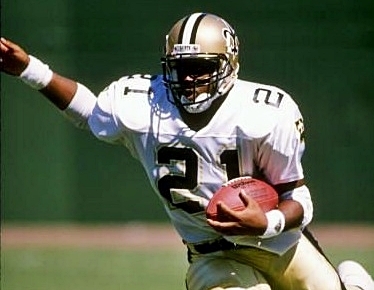 Honors: Hilliard was inducted into the Saints Hall of Fame in 1998. 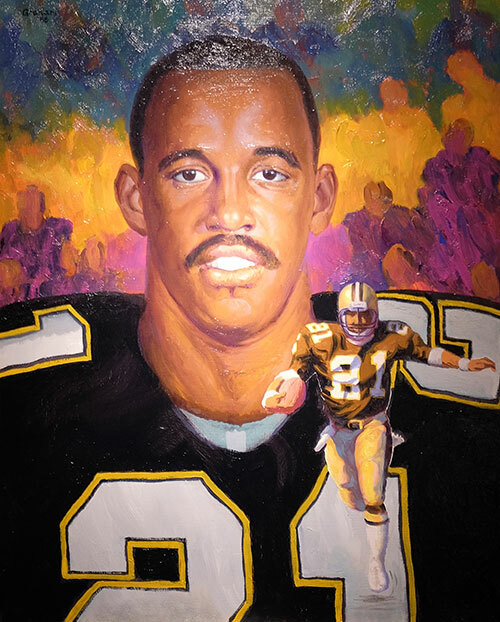 The Louisiana Sports Hall of Fame inducted Hilliard in 1997 and the Allstate Sugar Bowl Hall of Fame in 1999. He was named to the Pro Bowl in 1989.